Naxos have come a long way in three decades. Their product is no longer as cheap as chips, but they have few rivals when it comes to yearly volumes or breadth of repertoire. I’m particularly grateful for some of their long-running series, especially those devoted to Americana and music for wind band. I’ve reviewed a fair few albums from both strands, a number of which contain world premieres or works otherwise unknown to me. At the same time, I’ve noticed a general improvement in recording quality, with some newer releases sounding as good as those offered by premium-price labels. The American Classics project is probably the one I value most, not least for its ability to surprise and stimulate. And just as Naxos’s technical standards have risen, so too has the quality of ensembles and conductors featured. This pleasing state of play is epitomised by a very recent Michael Daugherty album, Trail of Tears: three brand-new concertos, one with the peerless percussionist Dame Evelyn Glennie, music and musicians well served by fine sonics. 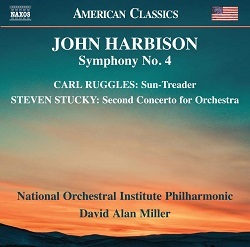 As it happens, that release introduced me to the conductor David Alan Miller, who also directs this mixed programme of 20th- and 21st-century works by Carl Ruggles, Steven Stucky and John Harbison. Of these composers, Harbison has the largest discography, with Stucky and Ruggles lagging far behind. Then again, Ruggles’ output was very small, of which Sun-Treader is probably the best known. Michael Tilson Thomas’s Boston account, recorded for Deutsche Grammophon in 1970, is the obvious comparison here; reissued on DG Originals, it’s also available as a special-order CD from Presto. Moving on to the Stucky, I’ve chosen a performance by Lan Shui and the Singapore SO (BIS); as for Harbison’s Fourth Symphony, I’ve lined up the only other commercial recording, with Ludovic Morlot and the Boston SO (BSO Classics). Ruggles’ Sun-Treader, which takes its title from Robert Browning’s poem, Pauline, is a technically rigorous construct that’s also very accessible. Although the piece was premiered in Paris in 1932, it had to wait another 34 years for its first US performance, with Jean Martinon and the Boston Symphony. And while the National Orchestral Institute Philharmonic isn’t exactly a household name – it’s an ad hoc band, drawn from members of the National Orchestral Institute each June – they are highly accomplished players, for whom this music holds no terrors. Full, firm and remarkably forensic, Miller’s Sun-Treader is more detailed and, yes, more colourful than Tilson Thomas’s. Producer-engineer Phil Rowlands’ spacious, recording certainly helps to ‘open up’ a work that can seem impenetrable at times. All of which adds up to a thoughtful, exploratory performance that’s very different from MTT’s more urgent, intensely dramatic one. The latter still sounds pretty impressive – the visceral timps a special treat – but I daresay an up-to-date remaster, similar to that provided for the recent BD-A of William Steinberg’s Planets and Zarathustra, would improve things even more. Top-notch accounts of Charles Ives’s Three Places in New England and Walter Piston’s Symphony No. 2 complete this bona-fide classic. Steven Stucky’s second Concerto for Orchestra, premiered by the LA Philharmonic in 2004, received the Pulitzer Prize for music a year later. In his liner-notes, Robert Lintott says the piece is ‘rife with musical puzzles’, although I doubt most listeners will be aware of the composer’s compositional tricks and tributes. More apparent is Stucky’s homage to the genre – Bartók’s seminal concerto springs to mind – with soloists and various instrumental groups (‘combos’) allowed to strut their stuff. I can well imagine performers relishing both the good writing and the composer’s seemingly boundless good nature. That’s certainly the case here, with Miller a sure and steady guide; indeed, he takes us on a fascinating trip, pointing out so much of interest along the way. What a tumble of tantalising ideas and sonorities, and how superbly rendered they are in this fine recording. Also, singly and severally, the players respond to this clever and compelling score with a zeal that most composers can only dream of. And as much as I admire Lan Shui, his performance lacks the chutzpah that makes Miller’s seem so rum and rakish. That said, the sound is refined, the playing light and luminous. The all-Stucky programme, which includes Dame Evelyn in Spirit Voices, is attractive, too. The headline act is the Harbison symphony, commissioned by the Seattle SO for their centennial celebrations in 2004. In five movements – but not composed in that order – the work’s opening Fanfare reminds me of Leonard Bernstein in St Vitus mode. What exhilarating music this is, and how joyfully executed. The gnarly Intermezzo, with its gently shimmering gong in the background, is similarly engaging. The central Scherzo is catchy – goodness, there’s a lot going on here – and the Threnody has something of late Mahler about it. That said, Harbison’s ‘voice’ is very much his own, the Finale gaunt but not emaciated. Pinpoint playing and a strong pulse predominate. So often in comparative reviews I sign off with comments like: ‘This newcomer is pretty good, but…’. I’m happy to report that, with the possible exception of Miller’s still excellent Sun-Treader, there’s nothing to criticise here. Yes, Naxos really have come a long way since 1987. And that goes for this series, too; it just gets better – and becomes more valuable – with each new instalment. Thoroughly modern Miller; plenty more, please.